Which day(s) and times work best for maximum impact for B2B and B2C? 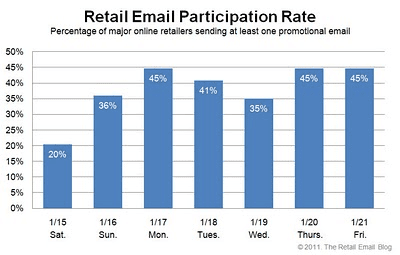 "Which day of the week is best for sending email?" has been a common question since marketers started email marketing. As with a lot of questions about good practice, the right answer is : "it depends", but it's fun to speculate. Ideally you want your email to arrive in the inbox of as many people as possible when they're sitting at their desk or picking up emails on go via smartphone. Greater impact will also be helped when there is less competition in the inbox from other email marketers. So Saturday and Sunday can be best for this. 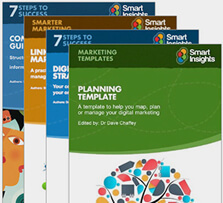 This comprehensive guide shows you how to take your email marketing strategy to the next level, covering a lot more than tips to improve your creative and copy, although we do cover this too. The answer will vary depending on whether you are marketing to a consumer or business audience. Regardless, it's definitely something you should trial and test. Tuesday to Thursday traditionally are seen as getting the best response in B2B. This is what I've often seen in B2B marketing, it perhaps reflects Monday/Friday being meeting days. Tuesday is usually peak day for web traffic too in analytics. Sending emails on Friday could be good since there is relatively little competition and you can pick up at home use at the weekend too. This is when we send our weekly roundup emails - it fits what we want to offer too. I do see some B2B marketers send emails from 4-8PM on Friday which doesn't make sense - we go for AM since you can also reach marketers at their desk on Friday. I was thinking about this question when I originally wrote post this because I was reviewing new data from the excellent Retail Email Blog which has a regular index of the best day of the week to send an email based on popularity of different days amongst US retailers. Here is their latest compilation which shows a fairly even distribution, but with Monday, Thursday and Friday being higher. Although this is a US, retail focus, let me know your throughs for different markets. Saturday - Well this is the lowest volume day of the week, so you have the least competition! Sunday - I don't understand why this is so high compared to Saturday - it does tend to be higher in web analytics than Saturday though. Monday - Relatively high, but often everyone is busy and the web analytics show volume is low. It makes sense in some markets like financial services where a decision is maybe made at the weekend and acted on on Monday. Tuesday - Traditionally the most popular day of the week for visits to a B2B site. Friday - Again a high volume since email may be read in work on Friday and at home over the weekend also - high competition though! FWIW We send our enewsletter on Friday since business folk may be winding down at the end of the week, although just as likely they're chasing deadlines. We find readers browse it on the weekend. So that's what I think - now please let us know what you think. TIA!